When you're looking to make a statement during the holidays -- or for any festivity or event -- nothing grabs the attention of passersby quite like an inflatable decoration. These fan-powered, cheerful plastic characters come in a variety of shapes, styles, sizes and colors. But one thing is certain for all of them: These decorations are made to weather the rain. To give your inflatable decoration a long life, utilize special handling during inclement weather. Add inflatable decorations to your lawn this holiday season. 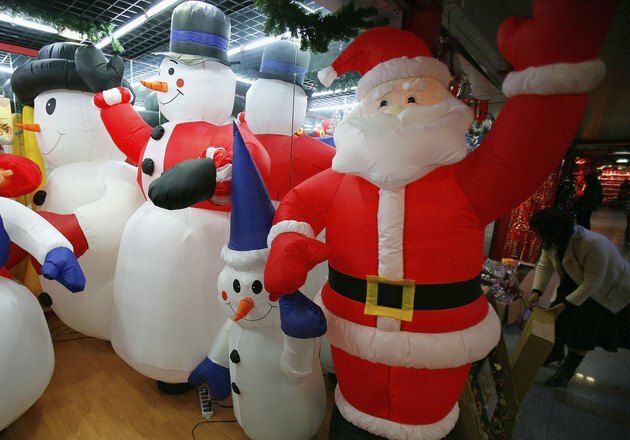 The large size of many inflatable decorations available today -- reaching anywhere from three to nearly 20 feet tall -- makes it clear these products are suitable for outdoor use. These decorations feature a weather-resistant design meant to shed water and snow, as they're manufactured from nylon and other synthetic materials, even the internal fans also come with weather-resistant components. Inflatable decoration manufacturers note that operating these products during light rain or snow is perfectly acceptable and should have no impact on the unit's operation. But, for the best performance, keep these products out of low-lying areas where rain puddles over time. In the event of severe storms or high winds, your inflatable decoration might become flooded to the point that it operates sporadically or quits altogether. Storing the inflatable decoration inside during stormy weather offers the best protection to avoid serious damage to it. If the decoration is left outside during severe weather and stops working, simply move the inflatable decoration somewhere where it can drain and dry completely. Plug in the unit to allow the internal fan to help further dry the material. These decorations are made to withstand light snowfalls, although some manufacturers advise against keeping these decorations outside when temperatures drop significantly below freezing (no more than -14 degrees Fahrenheit). Manufacturers also do not recommend that these decorations stay inflated outside for several days of heavy snow. Should the unit deflate because of it being left outside during a winter storm, allow the unit to fully thaw before attempting to re-inflate it. Dry your inflatable decoration completely before storing during the off seasons. This prevents mildew growth on the material and keeps it fresh for next year's use. In the event of light mildew, clean the material with a damp cloth and mild detergent. When packing your inflatable decoration for storage, refer to any storage or handling instructions provided by the manufacturer to get the maximum life out of your festive decoration. Megan Headley has been writing professionally since 2001. Her articles have appeared in “Shelter Magazine,” “Door & Window Market” and “Canada’s Elite Construction.” She received her B.A. in English from the University of Mary Washington.